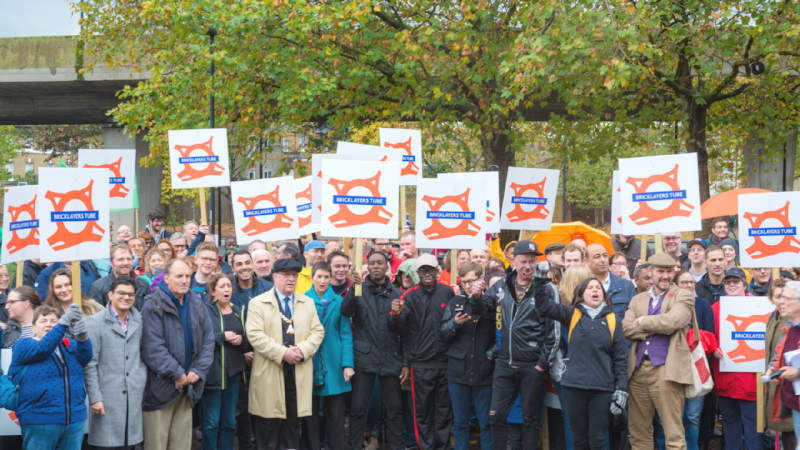 Caroline joined more than 200 people at a rally calling for a new Tube station at the Bricklayer’s Arms as part of the Bakerloo Line extension. Speaking at the rally Caroline gave her full backing for the new station, highlighting the immense benefits it would bring locally. Caroline also drew attention to how South London, and especially South East London, are badly served by the London Underground, with just 29 stations in the south of London compared to 250 north of the Thames. “The Bakerloo Line extension to Lewisham will bring huge benefits to South East London. An area that has long been neglected will see huge benefits from the regeneration that comes from improved transport links. The Bakerloo Line extension will also play a huge role in reducing road traffic and air pollution. “However there is a major flaw in the current plans as a station at the Bricklayer’s Arms is not being included at present. The installation of a shaft at this location will create immense disruption for residents yet they will be denied the benefits of a nearby station. A station at the Bricklayer’s Arms will also avoid a three kilometre gap in the line between the Elephant and Castle and the proposed Old Kent Road station. “Tube stations in Southwark were initially overlooked when the Jubilee Line extension was first proposed and history is repeating itself with a much needed station on the Bakerloo Line being currently overlooked.